Roses Last a Week, at Best, in a Vase of Fresh Water. 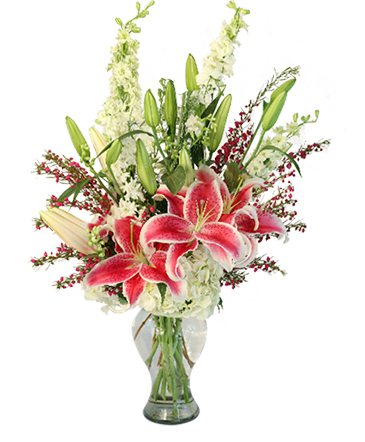 Carnations Are Known to Stay Fresh and Beautiful for a Month or More! This Variety is Called Moonshade and Their Purples Are Truly Stunning. 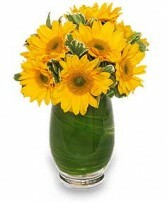 A Bunch of Medium (Longer Lasting) Sunflowers or Large Yellow Gerbera Daisies in an Aspidistra Leaf-Lined Glass Gathering Vase; Let Her(and Everyone in the Office) Know That You Think She Pales the Sun! A classic alternative for anyone on a budget. 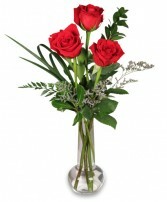 Show that special someone how much you care with three premium roses in a glass bud vase; limonium (sea-lavender) or a delicate genesta, along with a touch of lirope, complete this modern, eye-catching design.